As a writer, I’m sure you have struggled with how to come up with a great idea for a story. You aren’t alone, it happens to all of us. Some writers will assume that since they aren’t coming up with a good idea they have writer’s block. This isn’t the case because writer’s block usually has more to do with discounting your work as not being good enough. Coming up with an idea might seem like a random process. However, there are a few simple ways to increase your chances of creating great ideas for your writing. Every writer wants to come up with a great idea every time they start a book but many don’t consider what an idea really is. An idea is a connection, even the simplest idea is a combination of ideas you already have. We are constantly forming these connections spontaneously and unconsciously. It should also be noted that an idea will form when two different thoughts combine in an unexpected or unusual manner. Here are a few tips that will help you develop a reserve of ideas to draw from. 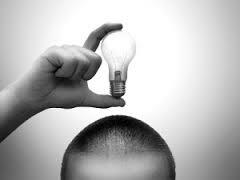 Stop thinking you’re not a creative person, or that only a chosen few brilliant minds can create brilliant ideas. You are a writer, no matter what you write you have and can create more ideas. The more exposure you have to different situations, people and places the more options you give your mind to form connections. Try new things, travel, read different books, don’t be afraid to do the things you normally do in a different way. Get into the habit of recording all of your ideas. Write them down in a notebook, type them into your tablet or add them to a voice recorder. The way you record them isn’t important, just make sure you always have the ability available. If you don’t record your ideas the minute you get them you may forget them. Having an idea and then forgetting it is worse than not having an idea at all. Never assume you need not record ideas, because you’ll remember them. Many ideas will come to you while you’re resting or asleep. Keep a notebook by your bed and get into the habit of recording your ideas as soon as you wake up. Whenever you come up with a great idea for writing, be thankful for it. This will create an additional positive reinforcement that will encourage the creation of more new ideas. This may seem strange, but try it, it works. If you find yourself not coming up with any useable ideas for a few days, don’t sweat it, it happens. Ideas will come to you when you least expect them and you will find out when you’re on a roll, the ideas come rolling in. When the ideas are coming in nonstop, that’s the time to record them and bank the ones you don’t use for when you have a dry spell. You will build up your reserve of ideas, which you will add to in spurts.